"Beautifying The Farm Home Grounds - C 1930 - By: Canadian Department of Agricluture." (1493) Beautifying The Farm Home Grounds - C 1930 - By: Canadian Department of Agricluture. -Condition: Good Plus Informational pamphlet. 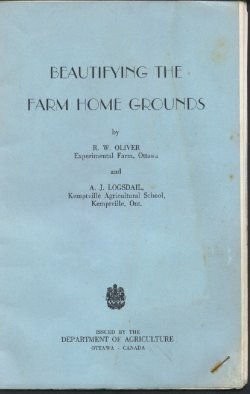 Was written by R. W. Oliver from the Experimental Farm in Ottawa and A. J. Logsdail at the Kemptville Agricultural School. Folded and typed booklet listing uses of plants, bushes, etc. in beautifying the grounds around the farm house. Also includes illustrations of yard layouts. Pamphlet measures 5 1/2" by 8 1/2" (folded) and has 6 pages. Price: $4.00 + shipping.